NEW ZEALAND 2018- Do you come with us? Several of you followed us during our exciting adventure in New Zealand last winter. And after we got back, many of you asked me how to discover such a distant land by motorcycle. We’ve never abandoned the idea of coming back again in the “biker’s paradise” on our part, so we are planning to do it for real the next April 2018. After our experience and thanks to many connections made during our tour, we decided to make available our experience for those who want to come with us. It’s always the same, when I have such an incredible experience, especially on a motorcycle, I need to share it with as many enthusiasts as possible, I can’t help my self. 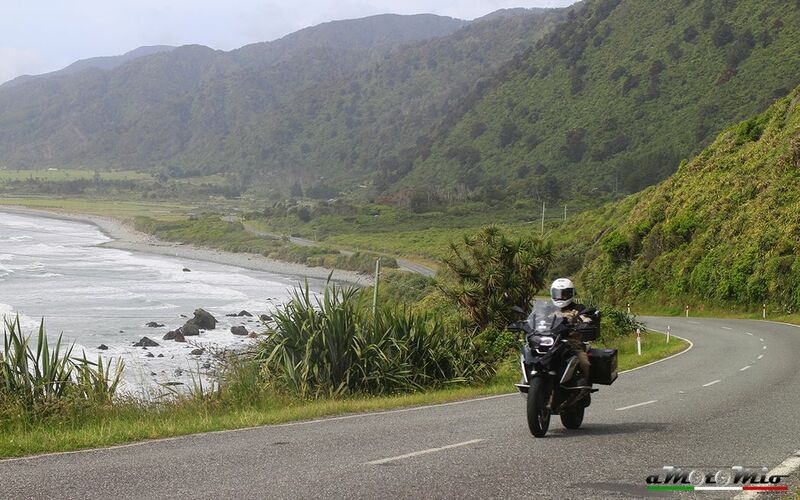 Wait, it must be understood, it’s not like we have suddenly become tour operators, on the contrary we still remain “ordinary bikers”, but we can count on our friends of Paradise Motorcycle Tour New Zealand, this way we can be sure to help organizing this trip in every way. And I’m telling you, this trip could stay in your memory as one of the best trip in your life. If you doubt about the language, the bike hire and the tour logistic… in short, all that things that make New Zealand look like a very far-off land, don’t worry, it’s not that hard to be organized, but in spite of we’re available to share our love for motorcycle, on the other hand we must say that the 20 hour flight with one stopover at least, needs some patience. But all this will be rewarded with amazing roads, unique landscapes and a particular wildlife, which you can only see in New Zealand and nowhere else. The tour, which we are defining with the guys of Paradise, will include both the islands, starting from the North then taking the ferry southbound with an increase of emotions and exciting discoveries. We will travel with a small group of bikers and with a tour guide, who will let us discover hidden corners, we will make a connection between the guide and you concerning the spoken language and the other needs. We have especially set up a Facebook group “New Zealand Tour 2018” (https://www.facebook.com/NZMotoTour2018) where we will share news, pictures, tips and logistical from now until the departure, so you can easily get information about the trip. Limited number of places available so we don’t have to manage a large group on the road. The support of Paradise Motorcycle will be crucial for the bike hire, for the overnight stays, but also a kiwi tour guide that will join us during the entire travel. We will ride Bmw Motorcycles, all new, less than two years old. All the bikes are equipped with a luggage system for you baggage and we don’t have to worry about routes ad maps; we will see the very best, stress-free. It’s no coincidence that #rideparadise is the most widely used hashtag during our previous travel. On our part we are giving advise on the basic logistics, the passport, the international license, the clothing and the flights. What do you want to do? You want to come with us?